Info "Send the rocket ship down the right path by spinning the road." Rocket Rotary is one of Orbulon's microgames in WarioWare: Twisted! The objective is to get the rocket to the right exit (where the arrow is pointing) by rotating the path. By doing so, the game is won. 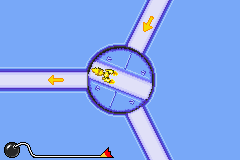 However, if the rocket takes the wrong exit or hits a wall, the player will lose. 1st level difficulty: Three potential paths are available. 2nd level difficulty: Four potential paths are available. 3rd level difficulty: Six potential paths are available. A shorter version of the music in this microgame is used in the microgame Laser Lineup. This page was last edited on April 3, 2019, at 20:10.